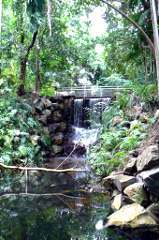 The Darwin Botanic Gardens contain waterfalls, tropical rainforest, fountains, forest walks, playing areas for kids of all ages and the original Darwin Wesleyan Church. Located just a couple of k's from the CBD and close to Mindil Beach and golf links and playing ovals, these gardens are a popular place at any time of the year. The gardens started as a site for experimenting with economically viable plants in 1886, when Darwin was only 16 years old. Labour was supplied by prisoners, mainly Aboriginal, with the occasional European and Chinese under the direction of father Maurice and then son Nicholas Holtze. 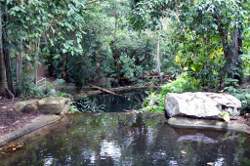 Nearly 90% of the gardens were destroyed by cyclone Tracy in 1974. However with the wet tropical climate and determined work by curator George Brown, by 1979 the gardens had 20% more plants than before the cyclone. 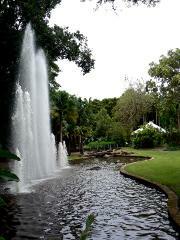 George Brown became mayor of Darwin in 1992 and remained Mayor up until his death in January 2002.Not only the gardens, also much of Darwin's green, tropical setting is a result of his influence. The NT Government renamed the 'Darwin Gardens' to George Brown Darwin Botanic Gardens in recognition of George Brown's contribution and 32 years service to the development of Darwin. 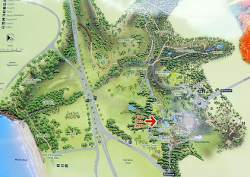 Convenient maps are placed around the gardens with a red arrow showing your location. There is plenty for the young at heart. 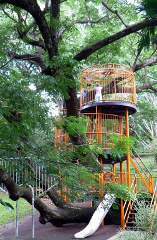 This tree house is a favourite, providing a good view from the top. Pools and waterfalls connected by paths and boardwalks snake through tropical rain forest and green grassy open spaces. The Gardens are used frequently for community events and functions. Barbecue facilities, shady areas with tables and benches and a world class children's playground make the Gardens a popular place for family activities. It is also a popular place for weddings and other functions. Enquiries about organised activities in the gardens should be directed to the Visitor Services Officer, located at the Orientation Centre, close to the Geranium Street entrance of the Gardens. 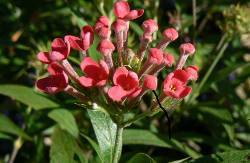 Phone 8981 1958 or email botgardens.darwin@nt.gov.au for details. Return from Darwin Botanic Gardens to Enjoy Darwin Home.